Is the ACO industry growing? Yes! In the video below, the U.S. maps show the exposure of ACOs by counties from 2012 to 2016. 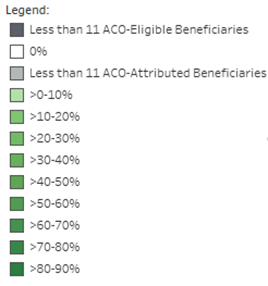 The darker the green, the higher percentage of ACO-eligible beneficiaries assigned to an ACO. You can easily see the ACO growth and spread across the country. Powerpoint slides (that allows you to pause on a year to analyze closer) of the maps are available to download for members. We encourage you to share the maps in your board and community presentations – ACOs are a strong, growing industry! •Darker shades of green represent counties with a greater share of ACO-eligible beneficiaries assigned to an ACO. The shaded county is the area of residence on file for the beneficiary. •Dark gray shading represents counties with fewer than 11 ACO-eligible beneficiaries. Due to our data use agreement, we are unable to provide exposure rates for these counties. •White shading represents counties with no ACO-attributed beneficiaries. •Light gray shading represents counties with fewer than 11 ACO-attributed beneficiaries. Due to our data use agreement, we are unable to provide exposure rates for these counties.